System, or GPS, aU.S. military navi- gation system, will provide all- weather, 24-hour coverage world- wide. GPS signals can also be ac- cessed by civil users but without differential corrections, their accu- racy is only about 100 meters. Cor- rections allow GPS navigation accu- racy to be typically improved to un- der five meters. Last year, Inmarsat finalized two new data collection and distribution standards to be used for very accu- rate navigation information for its users, in addition to having poten- tial uses for constantly updated worldwide data and news transmis- sions. The standards, one for point-to- multipoint data distribution service and the other a multipoint-to-point "backhaul" facility, have been de- veloped primarily for disseminating differential corrections for GPS navi- gation signals to Inmarsat-A termi- nal users. Typically, a differential correc- tion service provider establishes re- gional reference sites at which GPS signals are received and positional errors used to generate differential corrections. Using the point-to- multipoint service, these differen- tial corrections are then distributed to mobile users anywhere in the world on the Inmarsat-A system. "This service will be different from existing point-to-multipoint services on Inmarsat," said George Kinal, manager for navigation and appli- cations at Inmarsat's Land Mobile and Special Services Division, "since it will be available 24 hours-a-day and navigation information will be updated every few seconds for the mobile user." GPS signals and derive precise posi- tion information. 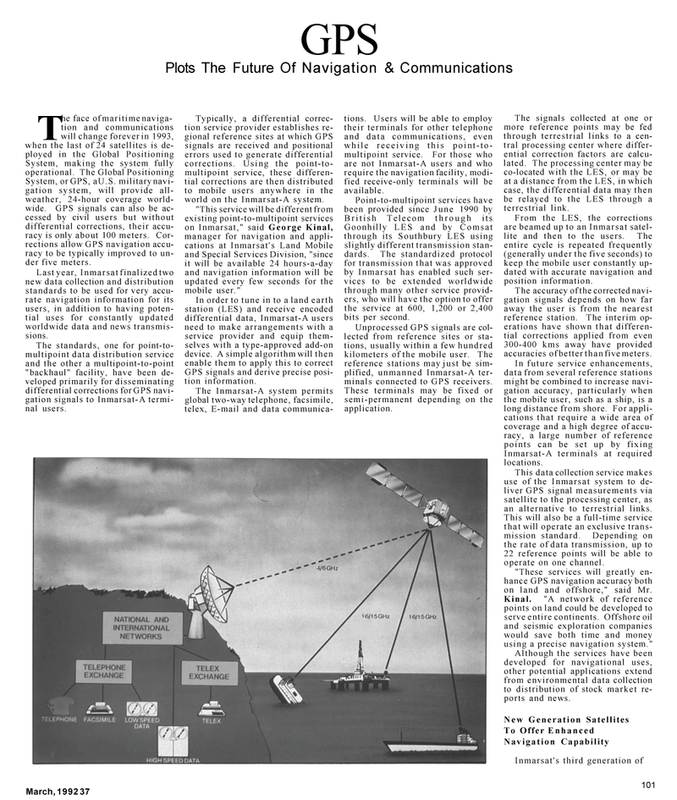 The Inmarsat-A system permits global two-way telephone, facsimile, telex, E-mail and data communica- tions. Users will be able to employ their terminals for other telephone and data communications, even while receiving this point-to- multipoint service. For those who are not Inmarsat-A users and who require the navigation facility, modi- fied receive-only terminals will be available. Goonhilly LES and by Comsat through its Southbury LES using slightly different transmission stan- dards. The standardized protocol for transmission that was approved by Inmarsat has enabled such ser- vices to be extended worldwide through many other service provid- ers, who will have the option to offer the service at 600, 1,200 or 2,400 bits per second. Unprocessed GPS signals are col- lected from reference sites or sta- tions, usually within a few hundred kilometers of the mobile user. The reference stations may just be sim- plified, unmanned Inmarsat-A ter- minals connected to GPS receivers. These terminals may be fixed or semi-permanent depending on the application. The signals collected at one or more reference points may be fed through terrestrial links to a cen- tral processing center where differ- ential correction factors are calcu- lated. The processing center may be co-located with the LES, or may be at a distance from the LES, in which case, the differential data may then be relayed to the LES through a terrestrial link. From the LES, the corrections are beamed up to an Inmarsat satel- lite and then to the users. The entire cycle is repeated frequently (generally under the five seconds) to keep the mobile user constantly up- dated with accurate navigation and position information. The accuracy of the corrected navi- gation signals depends on how far away the user is from the nearest reference station. The interim op- erations have shown that differen- tial corrections applied from even 300-400 kms away have provided accuracies of better than five meters. Inmarsat-A terminals at required locations. This data collection service makes use of the Inmarsat system to de- liver GPS signal measurements via satellite to the processing center, as an alternative to terrestrial links. This will also be a full-time service that will operate an exclusive trans- mission standard. Depending on the rate of data transmission, up to 22 reference points will be able to operate on one channel. "These services will greatly en- hance GPS navigation accuracy both on land and offshore," said Mr.
Kinal. "A network of reference points on land could be developed to serve entire continents. Offshore oil and seismic exploration companies would save both time and money using a precise navigation system." Although the services have been developed for navigational uses, other potential applications extend from environmental data collection to distribution of stock market re- ports and news.